Cindy Lord is one of my Silver Sisters (along with Jennifer Holm). The three of us shared Newbery Honor awards in 2007 and have been friends ever since. I honestly don’t know when Cindy finds time to sleep — she has been absolutely prolific in the past years, creating engaging picture books (featuring Hot Rod Hamster), chapter book series (Pet Shelter Squad), and kid-friendly middle grade novels. I am so pleased she made time in her insanely busy schedule to spend a bit of time with us today in celebration of not one but two books: Because of the Rabbit (Scholastic) — which is a dear and touching novel that I adored! — and Borrowing Bunnies: A Surprising True Tale of Fostering Rabbits, photographs by John Bald and illustrations by Hazel Mitchell (FSG/Macmillan). Hi Kirby! Thank you for inviting me to Friend Friday! I’m excited to tell you that I have two new books this spring—both about rabbits! In my new novel, Because of the Rabbit (Scholastic Press), my main character (Emma) has been home-schooled for her whole life, but is going to public school for the first time. She’s excited to start fifth grade, and on the night before school starts, she rescues a lost rabbit. Finding a rabbit seems like a hopeful sign that school will go well, and she names the rabbit “Lapi,” a nickname for “Monsieur Lapin,” a magical, trickster rabbit in the stories her French-Canadian grandfather used to tell about the animals around his farm. Of course even with all of Emma’s hopes and planning, things are not so simple. School is harder than Emma dreamed, especially making friends. Her first friend is a boy named Jack with special needs. They bond over their mutual love of animals, especially rabbits. It publishes on March 26th.Like all my novels, there are many real-life experiences sprinkled through the book. My husband’s heritage is French Canadian. I homeschooled my children for many years. I have a son with special needs. And we have pet rabbits! I started with a bonded pair, Blueberry and Muffin, about five years ago. Then we adopted Benjamin. I’ve always been very involved in animal rescue. In fact, I also have my first nonfiction book coming in mid-February. In addition to my own three pet bunnies, we also foster rabbits for a rescue. Rabbits can need to be fostered for different reasons. Sometimes they’ve lived lives of neglect and need to learn how to be a pet and trust people. Sometimes they’re too young to be spay/neutered and need to live somewhere until they’re eligible to be adopted. Then I’ll get a call asking me if I’ll foster a bunny or a family of bunnies. Three times I’ve had foster bunnies give birth at my house! So there’s never a dull moment. One day almost three years ago, I took in two foster bunnies that had been just rescued from a very poor situation. Two days after I brought them into our home, one had babies. My husband is a photographer, so he and I did a book together about fostering bunnies, starring that sweet little bunny family. They were one of our first fosters, but we’ve fostered around 25 rabbits now. 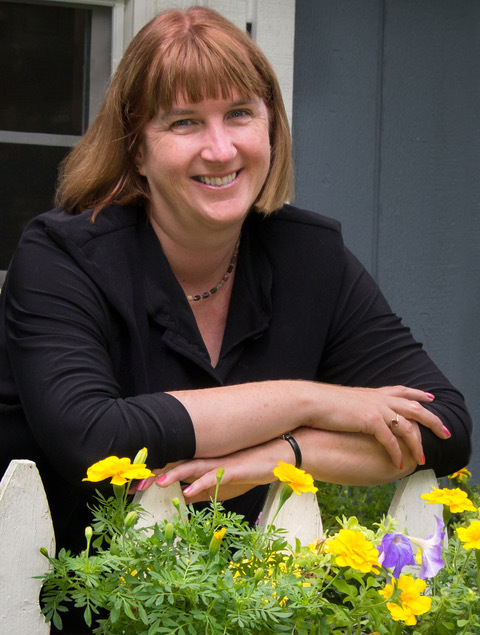 Cynthia Lord is a former elementary and middle-school teacher and the Newbery-honor winning children’s book author of Rules, Touch Blue, Half a Chance A Handful of Stars and Because of the Rabbit. She is also the author of the Hot Rod Hamster series, illustrated by Derek Anderson, and the Shelter Pet Squad series illustrated by Erin McGuire, all published by Scholastic. Her first nonfiction book, Borrowing Bunnies, is published by FSG/Macmillan. She lives in Brunswick, Maine with her family, a dog, two guinea pigs, and three rabbits. You can can learn more about her by visiting her website.